BEREA, Ohio (AP) — Baker Mayfield’s baptism with the Browns is complete. Some coaching chaos made it official. 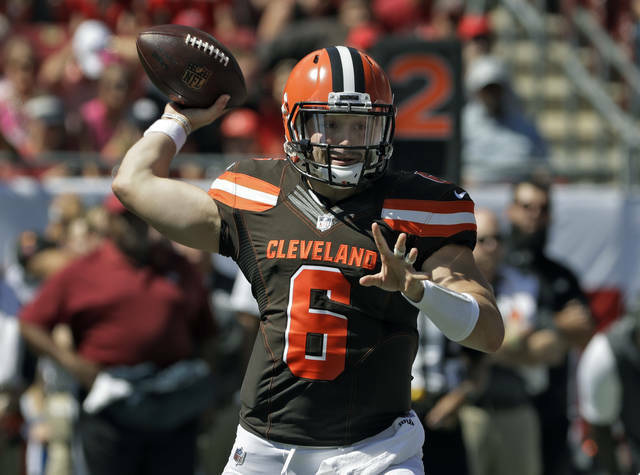 Cleveland’s rookie quarterback admitted Wednesday he was stunned by the firings of coach Hue Jackson and offensive coordinator Todd Haley, who were dismissed within an hour of each other on Monday. Owner Jimmy Haslam cited “internal discord” as the primary reason behind the team’s latest reboot. “It was different. It was new to us. We used that to come together,” he said. “I expect the guys in here to be grown men, to be experienced football players and to handle it that way and keep that same mindset of that we have the same goal. We need to reach that and work with each other. “With all the distractions, we will see what kind of men we have in this room. Not what kind of team that we have but what kind of men can handle a distraction the right way, can come together and focus on doing their job and doing it at a high level against a great team come Sunday,” Mayfield said. Rain forced the team inside its facility and the tone was noticeably serious during the portion of the workout open to media members. Williams barked out praise to a few players during position drills. Following practice, Williams said that like Mayfield, he was shocked by the firings and admitted to having reservations about taking over. “The hesitancy was, ‘Uh, not again,’ and I stepped away,” he said. “I stepped back, but then, it came back to this. I can’t spell quit, let alone do quit. I’m not going to quit on these players. I’m not going to quit on this organization. I’m not going to do whatever. That’s just how I had to feel, and when we went through the process, we went through the process, and now, let’s get on to Kansas City. I blinked a little bit. The brash and boastful Williams didn’t announce his candidacy for the job, and he refused to address his role in the New Orleans “Bountygate” scandal. The NFL suspended Williams for the 2012 season after ruling that while the Saints defensive coordinator he orchestrated a program by which players were paid for knocking opponents from a game. The Browns are trying to stay in the present, and that’s the challenge. As the losses mount, this season is beginning to feel like so many others. But left guard Joel Bitonio doesn’t feel the same sense of dread as in previous years. “I don’t think we’re giving up,” he said. “This is a step to try to improve the team. We made a decision early in the season, but we have half the season left. We’re a few plays here and there from being 5-2-1 or 4-3-1. NOTES: Because of his connection to Mayfield, Riley has been mentioned as a potential candidate for Cleveland’s coaching job. Mayfield feels his former coach would adapt easily to the pro game. “I think his style would work, but that is just because of who he is,” Mayfield said. “He is smart. He gets his guys to believe in him.” … With RBs coach Freddie Kitchens taking over for Haley, the Browns hired former NFL back Ryan Lindley to their staff. Lindley played for Kitchens with Arizona.